Eat More Fat to Prevent Heart Disease? This week, I will be discussing ways in which to prevent heart disease that may be, if not outright surprising, then at least somewhat intriguing. The first surprising way to prevent heart disease is to eat more fat. So, I know what you are thinking, Wow! Are you telling me that I can go out and eat Big Macs and candy bars to my heart’s content??? Of course not…let’s have some common sense. What I am saying is that the more omega-3 fats you eat, the better it is for your heart. These fats are anti-inflammatory and inflammation has been shown to be a crucial step in developing plaque and heart disease. 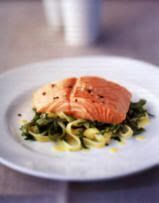 Omega-3 fats are most commonly known to be found in fish, such as salmon, black cod or sablefish, and halibut. They are also found in foods like flaxseeds and walnuts. However, these vegetarian sources are made up of a slightly different type of omega-3 fat that your body has a harder time converting to the kind that it needs. In fact, research has not shown the same kinds of results from flaxseeds and walnuts as they have from fish. So, eat your fish and love the fat because it loves you! Tip of the Day...Every Day Should be a Party!